Diaper dermatitis, or diaper rash is a common complaint among new parents with infants, with a prevalence up to 35% of infants experiencing one episode within the first two months of life (Hughes, 2016). Despite the distress parents may face, this is routinely a non-complicated, easy to treat condition for providers. Education plays a key role. This is a contact dermatitis that is usually encountered in the area of a covered diaper. Commonly, it is noted on the buttocks, perineum, abdomen, or groin. Other colloquial terms include diaper rash, napkin dermatitis, or napkin rash. It is the most common skin complaint in infants and has a peak incidence between 7 and 12 months of life. 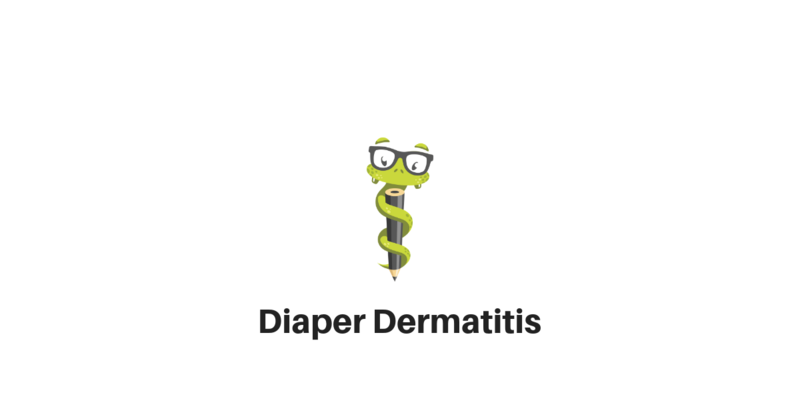 The pathophysiology of diaper dermatitis is complex, but involves multiple factors. The initial irritant is moisture in the diaper, including urine and feces. Prolonged skin exposure to the above moisture causes skin breakdown and an increased susceptibility to enzymatic and chemical dermatitis. Friction from the diaper exacerbates the condition. Once the skin barrier is broken, micro-organisms, including bacteria and fungal, proliferate. (Hughes, 2016 and Horii, 2019). Interestingly, breast feeding has been found to protect against diaper dermatitis. Once the skin barrier is broken down, opportunistic pathogens present, most commonly Candida Albicans. This accounts for up to 75% of diaper dermatitis. Other risk factors for development of the condition include infrequent diaper changes, use of cloth diapers, family history dermatitis, recent acute illness with diarrhea, antibiotic use, or warm climate. When taking a history in a patient whose parents are concerned about diaper dermatitis, it is important to note the onset, duration, severity, and any changes in the rash since onset. The presence of comorbid rash outside of the diaper area may point to a significant bacterial infection or another diagnosis altogether. Other infants presenting with rash as well or a local outbreak of rash points to another diagnosis. Recent illness, presence of new onset diarrhea, and recent antibiotic use are also helpful. Over the counter regimens should be queried. On physical exam, vital signs should be primary. Fever points toward a more serious bacterial infection, as fever is not usually present. Vital signs are routinely normal. The general impression of child is also important. In some cases, child may be crying and uncomfortable, or may be carrying on normally. Examination in the diaper region clinches the diagnosis. Mild dermatitis will classically show erythema and mild papules and as discussed above, is usually in the distribution of the diaper. The skin folds in diaper dermatitis are classically spared. In moderate disease, the erythema becomes more confluent, more severe, and maceration/erosion of the skin can be seen (Horii, 2019). In severe disease, the erythema is much worse with nodularity, erosion of the skin, and open sores. The classic satellite lesions that are seen with Candida Albicans infection are commonly tested on PA school examinations as well as boards. These are discrete, annular/macular lesions that are away from the original rash. The differential diagnosis for this condition is fairly straight forward, but there are other diagnoses to consider. This includes contact dermatitis separate from diaper dermatitis, scabies, allergic dermatitis, and comorbid bacterial cellulitis. The diagnosis is traditionally clinical, but other methods such as a KOH preparation can be considered, but this is not routinely completed. The majority of treatment in relation to diaper dermatitis is prevention and education to parents regarding the management. Parents should be counseled to expose the diaper area to air as much as possible and to change diapers frequently (as soon as they are soiled). Absorbable diapers do help to wick moisture away from the skin. Fragrance free wipes are helpful. Barrier creams routinely used include zinc oxide containing preparations. These include Desitin or Balmex, which should be applied to dry skin. For patients that do require more than over the counter therapy, topical corticosteroids are a first line treatment. In my practice, I typically use hydrocortisone 1% for 3 to 7 days, in addition to good patient education in regards to prevention and home treatment of the condition. This typically works well. If there is significant concern for Candida involvement, a topical cream such as clotrimazole, ketoconazole is reasonable. Topical mupirocin is also helpful if there is concern for open areas that could become infected with bacteria. Due to the risks for thinning of the skin, moderate to high potency topical steroids must be avoided. It is important to ask parents about over the counter remedies which may be used. Although with the best intention, there are over the counter remedies that can be harmful to the skin. Corn starch, boric acid, baking soda, camphor, phenol, all should be avoided due to skin absorption and risk for other complications (Horii, 2019). I hope that this has been a helpful review of diaper dermatitis. It is a common source of visits to both primary care and urgent care centers. With the right education, the treatment can be very simple and provide parents with relief. Hughes, Dennis E. (2016). Dermatitis, Diaper. 5 Minute Clinical Consult. Wolters Kluwer. Horii, Kimberly A (2019). Diaper Dermatitis. UpToDate. Date of Access 11 February 2019.